Old dude here. I think Stephen has the nub of it about us old dudes - the knives are purtty! When we're young we discover beauty in God's most delightful creation - women - and if we can't collect the gals we can stack their pictures in 'mens magazines', creating harems of the imagination in the backs of bedroom closets! 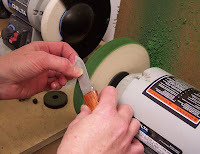 When we slow down, we find beauty in the less immediate - more in the fine creation of human hands - especially in well designed and finished small and pocket knives. With age, there's less of passion and chaos, more a delight in materials and technique mastered, and beauty which need not fade... nature is tamed and order maintained. I will not count my knives, I delight in simply having them around. They make me smile, as do my memories. Thanks for the course, will look forward to the post about the leather strop and honing by hand. Anon—Wow, thank you for the thoughtful response. That's a great question. My mom could open a shoe store with her collection. Ah! 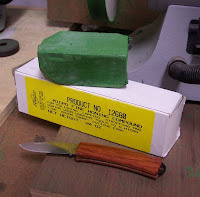 The magic green stick of honing compound. I've looked all over the shop and can't find mine. But I'm sure if I buy a new one I'll find the old one within the week. Can you please provide more information about those two locking-back knives with the black handles in your last photo? Manufacturer, model, etc. ; are they purchased in those configurations, re-ground, etc.? 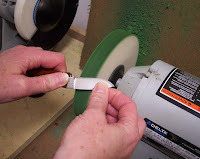 I did not regrind them; both blades are in their original shape.